In his personal work as a physical therapist, and volunteer work as a humanitarian, Hamdy is motivated by compassion for others. Those who know Hamdy best, as well as those who meet him for the first time, can attest to his sincerity in serving those in need. One of Hamdy’s core values is education—he pursued his own educational journey with patient drive, and now teaches others for greater impact. Dr. Hamdy Ahmad Radwan grew up as part of a large family in Giza, Egypt, right near the pyramids. After his father passed away while he was in middle school, he spent the following years caring for his mother while also continuing his education. Though accepted into different medical schools across Egypt, Hamdy ultimately opted to attend a physical therapy program close to home so he could continue to care for his mother. 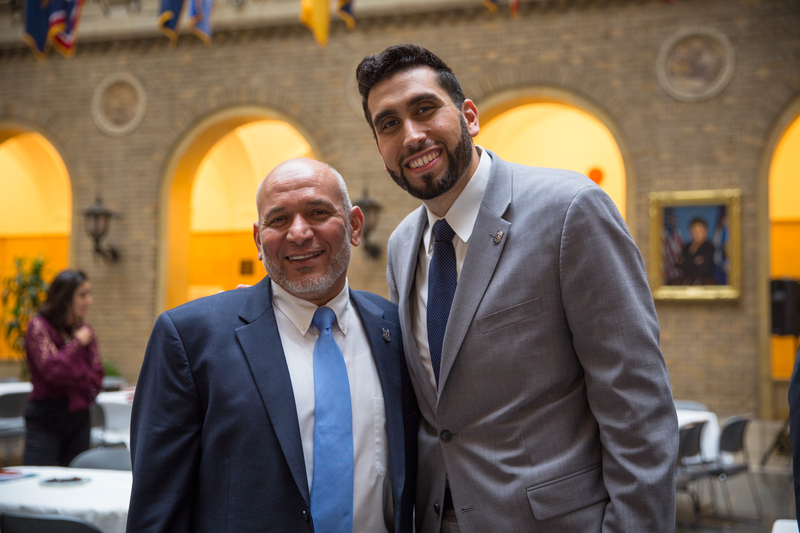 This innate humanitarian inclination laid the foundation for Hamdy’s future of service in his career and with Islamic Relief USA. Hamdy received his physical therapy degree in 1981, and came to practice physical therapy in the US in 1990 after receiving an offer from the southeast Washington DC general hospital, where he worked for several years before pursuing his Ph.D. in Physical Therapy at the University of Texas in Houston, where he focused on spine motion and analysis. “I noticed the spirit of volunteerism once I came to the United States,” Hamdy shared. “My daily routine for years has been to work and volunteer.” During his time in Houston with his family, Hamdy devoted hours toward investing in the community, in conjunction with Islamic Relief USA. Hamdy helped to feed the hungry, start a refugee program, and develop educational opportunities. He was also involved with the greater Muslim community through helping to initiate Al-Iman Academy. Near the year 2000, after a brief period of returning to teach at Cairo University, Hamdy received an offer to teach in North Carolina at Winston-Salem State University, and has been teaching there ever since—almost 19 years later. He uses his tenured position as a full-profess to conduct research and teach his students about the humanitarian mission underlying the field. Recently in his “Global Health” course, he asked students about their personal definitions of happiness, then challenged them to think about subjective happiness in a worldwide context—especially the happiness of the poor. “I regularly give to the university, to build the program there,” he shared. In fact, Hamdy’s work to support his department’s free health clinic has allowed many Syrian and Iraqi refugees, as well as members of the Hispanic community in the United States, to receive services free of charge. Hamdy also travels with Winston State professors to Cairo to promote cross-cultural exchange. Hamdy’s transition from an Islamic Relief USA volunteer to an IRUSA board member was a natural one. His track record as both a long-time volunteer and international professional devoted to the service of others allows him to advise the board with experienced insight guided by perennial compassion.